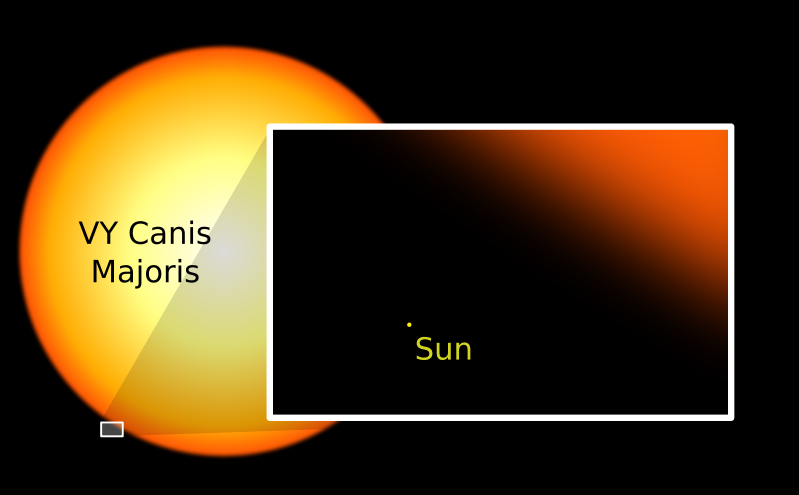 Of all known stars, the VY Canis Majoris is the largest. This red Hypergiant star, found in the constellation Canis Major, is estimated to have a radius at least 1,800 that of the Sun’s. In astronomy-speak we use the term 1,800 solar radii to refer to this particular size. Although not the most luminous among all known stars, it still ranks among the top 50. Hypergiants are the most massive and luminous of stars. As such, they emit energy at a very fast rate. Thus, hypergiants only last for a few million years. Compare that to the Sun and similar stars that can keep on burning up to 10 billion years. VY Canis Majoris a.k.a. VY CMa is about 4,900 light years from the Earth. This value, however, is just a rough estimate because it is too far for parallax to be used. Parallax is the most common method for measuring star distances. It is actually a special kind of triangulation method, i.e., similar to the one employed by engineers that make use of angles and a fixed baseline. Some stars exist in pairs. These are called binary star systems. There are also multiple star systems. VY CMa, however, burns as a single star. Being a semiregular variable star, VY Canis Majoris exhibits periodic light changes. Its period lasts for about 2,200 days. The French astronomer Jerome Lalande is credited to be the first person to have recorded VY CMa. The entry in his star catalogue, dated March 7, 1801, lists it as a 7th magnitude star. Apparent magnitude is a unit of measurement for the brightness of a star as observed from Earth. The greater a star’s magnitude, the less bright it is. Hence, a star with a magnitude of 1 (a.k.a. a 1st magnitude star) is considered among the brightest. There are also negative values, which denote even brighter bodies. Just to give you an idea where VY Canis Majoris stands in terms of brightness, the Sun (the brightest from our perspective) has an apparent magnitude = -26.73, while the faintest objects observable in the visible light spectrum (as detected from the Hubble Telescope) have magnitudes = 30. It was once believed that VY CMa was a multiple star system. This was due to six discrete components that were measured by observers during the 19th century. Scientists eventually realized that the said discrete components were actually bright areas of the surrounding nebula. What is the biggest star we know?